So the Whistler Mountain Bike Park opened for the season yesterday! Mountain biking has quickly grown to become Whistler’s most high-profile summer attraction, but even before our ski lifts began shuttling fat-tire types up Whistler Mountain Whistler already had a well-developed biking scene. It’s just that hardly anyone knew about it. 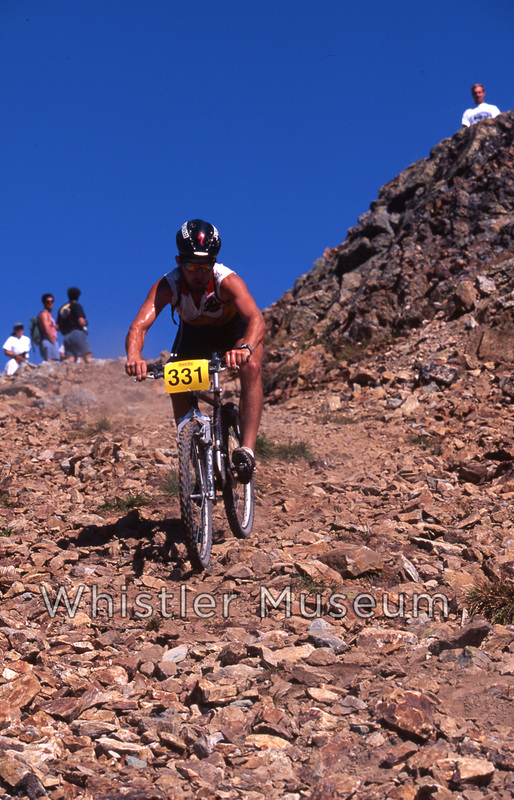 Mountain Biking Whistler, early 1990s. “Mountain biking in Whistler today is like skiing was twenty years ago. In those days the skiing was every bit as astounding as it is currently, but it hadn’t been dubbed “World Class” yet… All we had was the best skiing in the world and hardly anyone outside the Lower Mainland knew or cared anything about it.” Just to be clear, Charlie wasn’t complaining about this lack of recognition. The article describes how Whistler decommissioned logging roads formed the backbone of the local trail network, frequently re-cleared by rogue bike enthusiasts to provide smooth climbs and trunk roads servicing an ever-expanding network of single track routes. Newcomers to the sport will be surprised to learn how many of these trails had already been built in 1993. 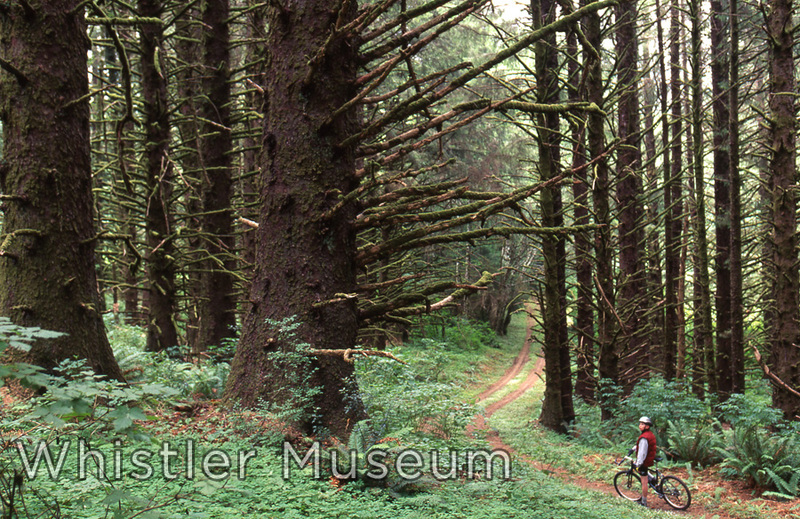 Some of Whistler’s bike trails might even be older than most of the people riding today! 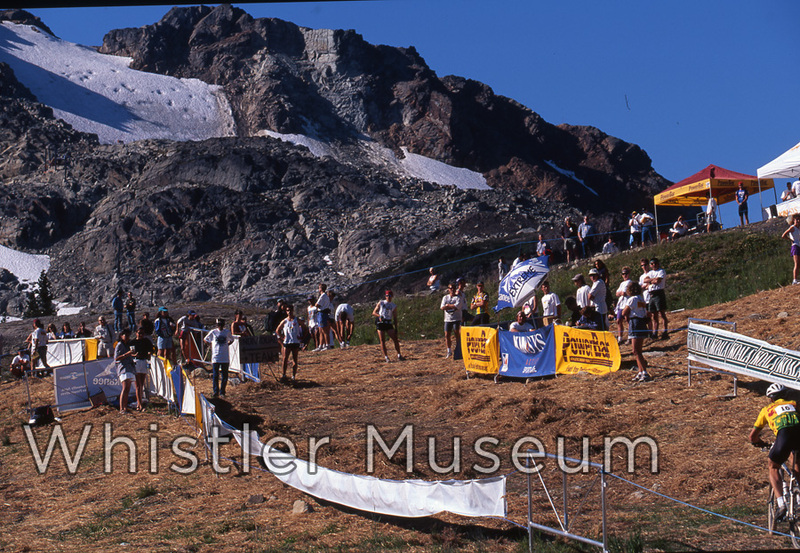 An early x-country race on Whistler Mountain, early 1990s. About as technical as downhill descents got at the time, many of the images from in this collection show the racers walking their bikes down this section. Way up in the Whistler Alpine, early 1990s. Among Charlie’s suggestions were now-classic trails such as Cut Yer Bars (“offers a truckload of technical drops, obstacles, climbs and slalom descents”), Northwest Passage (“runs like a roller coaster across creeks and big sweeping corners”), the Black Tusk climb (“not to be missed for those who love gut-wrenching climbs”) and a few Westside favourites like A River Runs Through It (“you may never want to leave”). 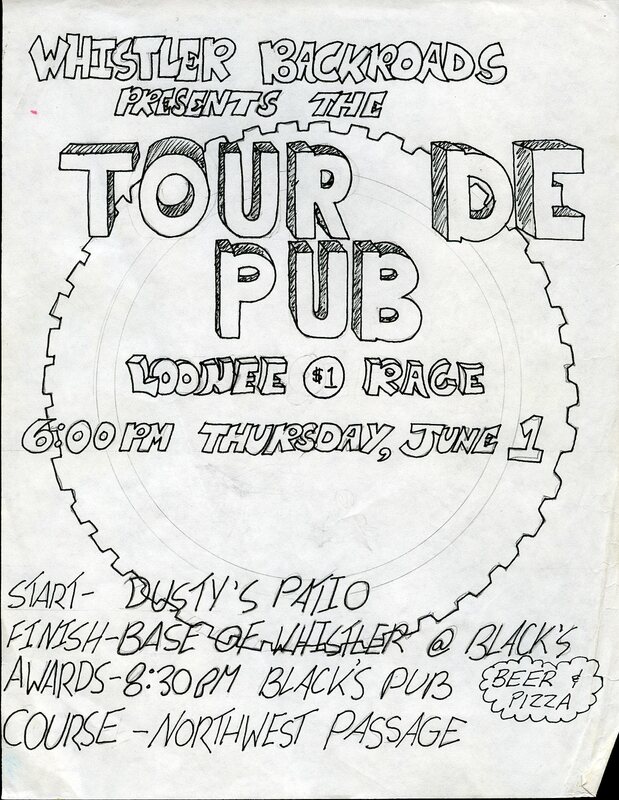 A poster from an early Loonie Race (late 1980s). These weekly summer rides still run to this day (although inflation forced them to be re-branded “Toonie Rides” a few years back) are now massive social events, often with hundreds of participants. As an aside, Charlie noted that “the municipal government has yet to be convinced that the bike scene can provide sufficient retail kickback to jump on the bandwagon.” Since that assessment the RMOW has clearly seen the light, as it is widely considered a case study in the positive impacts that follow from local government support for mountain bike trail networks. Interestingly, the first place Charlie suggested for prospective riders was Lost Lake Park, which is now a municipally-operated bike park. Fast forward 20 years and Whistler’s biking scene is firmly in the situated in the mainstream. As the trail network expanded, all the accompanying markers of “world class” status Charlie referred to are here as well: overseas visitors, global media recognition, dozens of dedicated bike shops, and media blitzes that are as calculated and labour intensive as the trails themselves. For more info on the history of local trail-building, check out WORCA’s trail history article, and “Quest for the Holy Trail” run in the Pique last summer. This entry was posted in Recreation, Whistler Blackcomb. Bookmark the permalink. Very interesting article. While a lot of things around Mountain biking have changed a lot in the last 25 years, many things also seem to stay the same. Great video!